Conch shells had many uses in the Mexica world. Blowing in them was a call to ritual, or warfare, or indicative of imperial activity. But we often forget that those shells weren’t empty! In fact, little animals lived inside them, and they had their own lives and uses beyond just that of providing an instrument. Studies of shell middens (disposal sites) in many regions imply that molluscs (USA: mollusks) were used in great numbers, and that they were collected with relative frequency. Most likely, it was the job of everyone in local villages to collect oysters, clams, and snails. They were then put to household or product use, or sent out for trade. 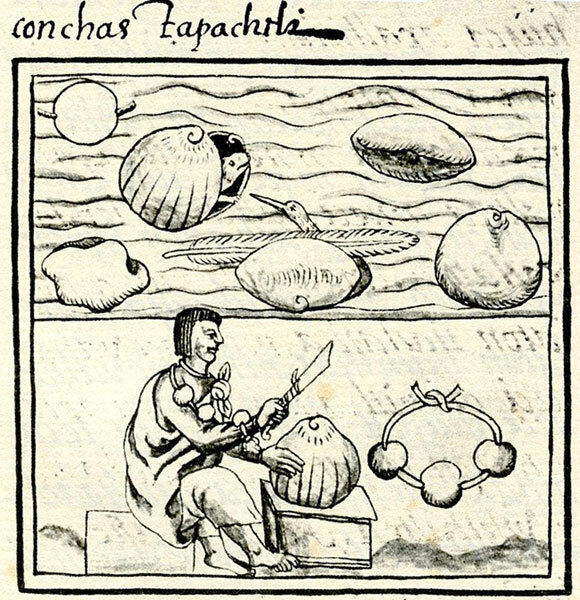 It is important to remember that the imperial center of Tenochtitlan often requested any exotic, or uniquely regional, product as tribute, so it is possible that even more molluscs and shells made that trip. Molluscs were a major source of protein for water-dwelling pre-Columbian peoples, including the Mexica. The briny waters of Lake Texcoco were home to many molluscs, including oysters and clams. 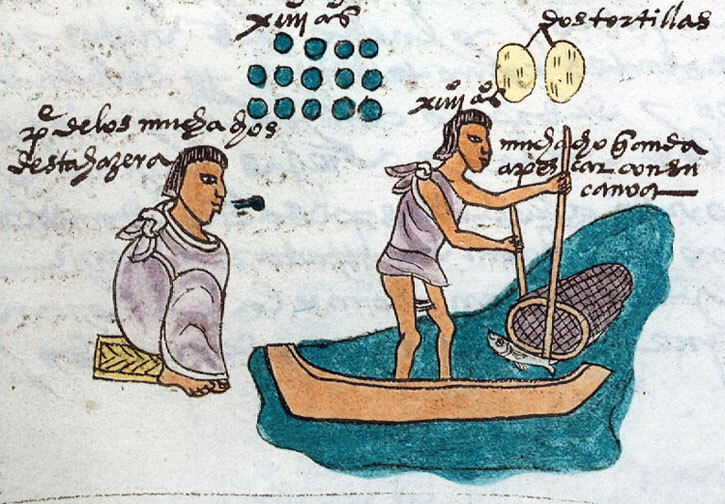 Scenes in the Codex Mendoza (pic 2) demonstrate that fishing and collecting from the lake was an important coming of age ritual, and some people made their living from what they found in the water. Beyond their use as food, some molluscs could also be used as dyes, and shells from smaller molluscs were often used to create jewellery. In Book 11 of the Florentine Codex, Franciscan friar and Spanish chronicler Bernardino de Sahagún discusses jewellery-making. His indigenous informants explain, “I cut the seashell. I make it into a bracelet. I form it into a necklace. I provide myself a bracelet with it. I provide myself a necklace of it. I use it; I make use of it; I exalt it.” Shells are obviously quite beautiful, but they are also symbolically valuable to the Mexica as they represent fertility and eternal life. This may be one of the many reasons Mexica artisans chose to use them as jewellery. Most of the shells we see in Mexica depictions are Queen Conch shells, one of the largest varieties of mollusc found in the New World. Unlike what they could find in their lake systems, the Mexica had to travel to get to the Queen Conch. Seven varieties of conch lived in the warm shallow waters of the Gulf of Mexico and the Caribbean, and all of these varieties were fished for centuries. The Queen Conch, or strombus gigas, could grow up to twelve inches in length and five pounds in weight. These herbivorous (plant-eating) sea creatures live inside a thick exterior shell with a pink or orange glossy interior. Their shells thicken as they age, and therefore some of the most popularly collected shells are from the older animals. After eating the mollusc inside, which had to be disengaged from the shell, the exterior was often retained for a variety of ritual and religious uses. Most of our discussions centre around those uses, as they are illustrated in colonial-period manuscripts, Mexica sculpture, and described by colonial-period chroniclers. 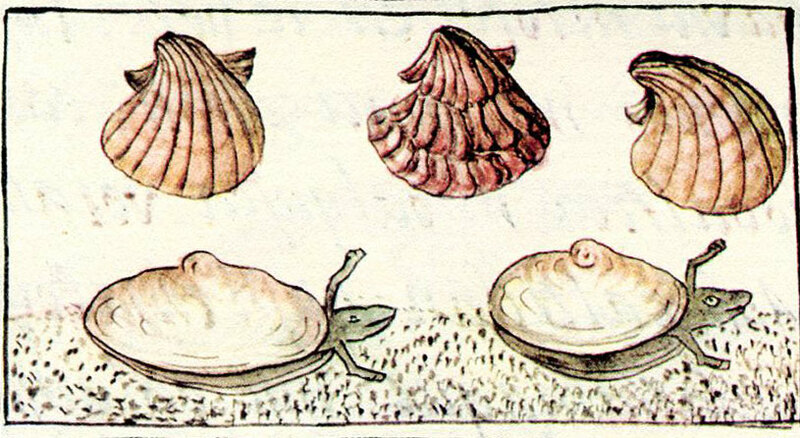 Yet the animals that lived inside those shells served different purposes, and the variety of shells goes beyond simply that of the Queen Conch. 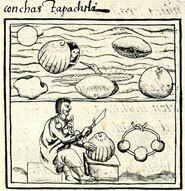 Molluscs were both useful and symbolic in the Mexica empire.